Having watched firsthand some of the events and the aftermath of the recent riots in London, I have been shocked and dismayed by the response of so many people looking to blame the youth as the sole cause and reason for the unrest. The riots took place in most neighbourhoods across London and also reached several other British cities. The theft and arson have been widely reported on, but what I think has received too little attention is looking for solutions beyond locking up the perpetrators and throwing away the key, or in fact throwing whole families out of council housing as is currently being proposed. I fail to see how draconian punishment will prevent such events in the future. 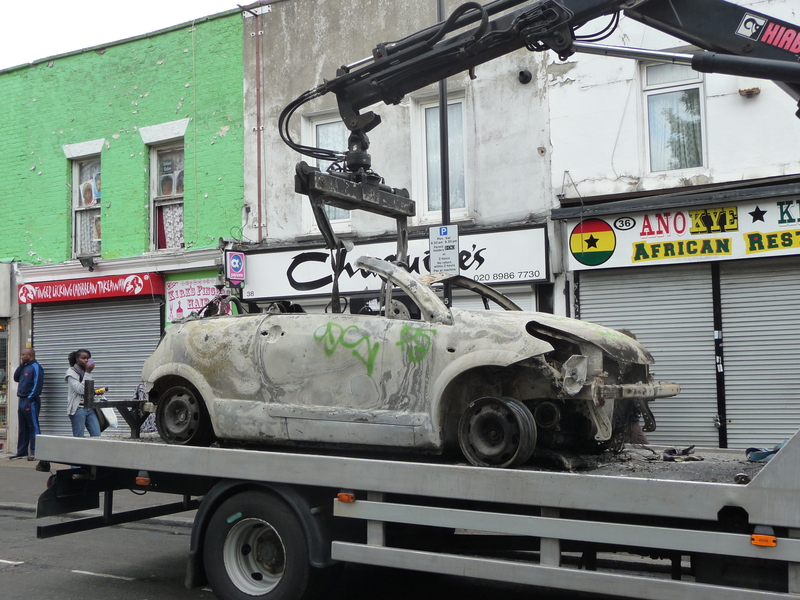 Perhaps we should try to dig a little deeper and understand why these melting points occur – I have seen recent commentary comparing the riots in London to riots in LA in 1992. Common factors that preceded both events are “economic hard times, unemployment and the withdrawal of government aid, causing social tension that remains just below the surface in poor minority neighborhoods until ignited by a spark”. Sounds like a fair assessment to me. In the UK over the course of the last year there have been large protests about the governments gutting of public services, rising levels of unemployment and students have been outraged at the proposed hike in tuition fees. The best description I have heard of proposed changes in the UK is class warfare and I can only imagine what it must be like for young people finishing high school or graduating from university in the current economic climate. Perhaps unsurprisingly many young people feel they have nothing left to hope for, that they have no stake in the current system and I have no idea why so many people are surprised by the recent riots in London and in other cities in the UK. I am surprised that they have not happened sooner. And the UK is obviously not alone in societal unrest – we have seen unprecedented levels of protest across the Arab world and also unrest in Latin America. I recently spent some time in Mexico and found an interesting political movement gathering momentum. Mexico has a long tradition of uprisings, revolt and revolution – it is partly why I love the country so much. I spent a month in Cuernavaca (just south of Mexico City) in April and was surprised to find palpable outrage against the government. From the protests I saw there people were particularly concerned about the war on drugs – in 2006 president Calderon announced a crackdown on the drug trade in Mexico. Subsequently many lives have been lost (it is estimated that over 40,000 people have died in the last five years) and this disproportionately affects young males; the same demographic disproportionately affected by job losses and poor economic prospects the world over. 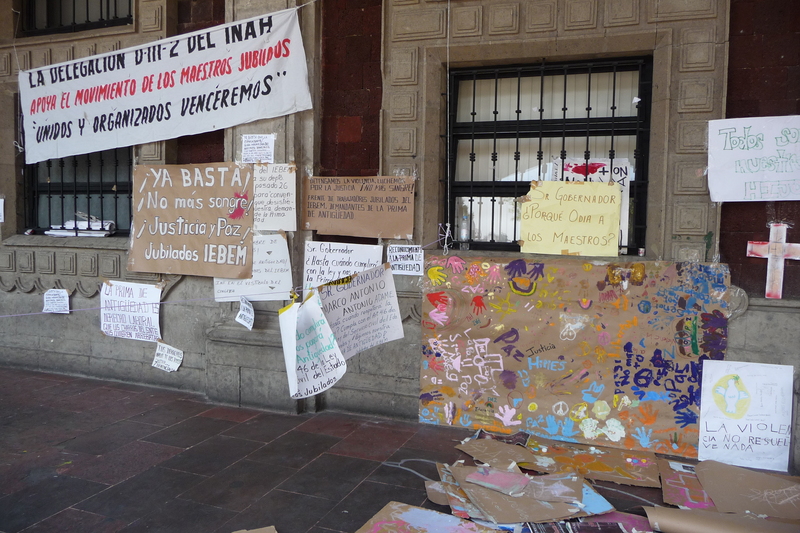 The zocalo (main square) in Cuernavaca was adorned with dozens of handmade banners emblazoned with such messages as ‘Enough is enough – we want peace and freedom’ and ‘Obama, Calderon – Ciudad Juarez is not a warzone’. Someone has painted the outline of bodies on the ground with red splashes of blood-like paint, accompanied by the words ‘you’ and ‘me’. Many of the banners carry messages of anger against the governments handling of the drug wars and declare that Mexico needs to look after its own citizens first, and not those of America. A recurrent theme of the signs was about the number of young people who have either died or gone missing as a result of the drug crackdown. The people of Cuernavaca are not alone in their dissatisfaction with the current government in Mexico – unrest has been taking place in various forms across the country for several months. 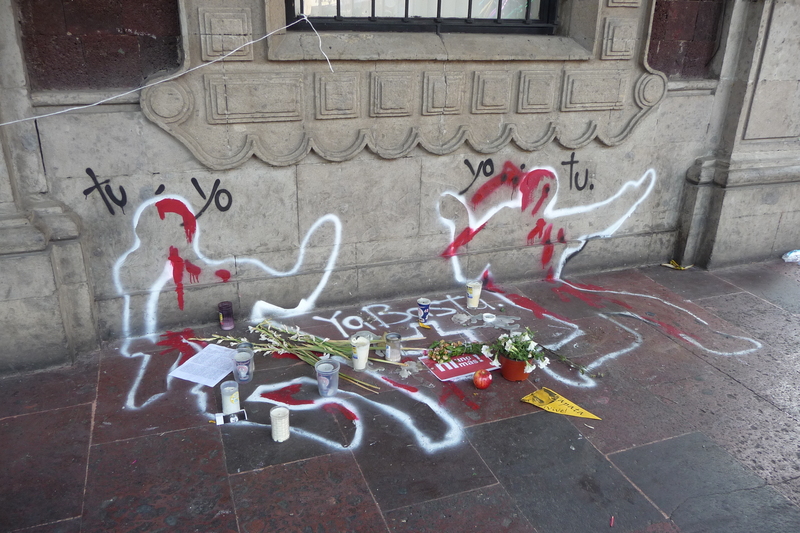 Poet Javier Sicilia has been leading a movement of mass protest and marches across the country since the murder of his 24 year old son in Cuernavaca. Aside from outrage over the war on drugs, many Mexicans share similar concerns to what we are seeing in the UK at the moment. When I visited Mexico City the zocalo had been transformed into a makeshift campsite. Dozens of tents lined the large square and most of them carry the logo of Sindicato Mexicano de Electricistas (the Mexican Electricians Union, who 2 years ago were declared illegal by the government). People had been camped out here for 3 weeks when I visited and one man explained to me that the main concern here is about education and work prospects for young people leaving school or university. Apparently schools are being closed and education standards are slipping, leaving many with uncertain futures. I watch an energetic performance in the square, with 3 dudes rocking out on stage. A man comes out in between songs and explains their concerns – that not enough young people have access to decent education; that those who do go to university cannot find jobs; that the government should be doing more to help. Mexico currently seems to be ‘facing the most critical situation since the Mexican Revolution’. It is not hard to see why young people in particular do not see a lot of hope for the future – youth unemployment is very high, there are systemic problems with the education system and the government seems grossly out-of-touch with the population. Clearly we are failing our young people today. In the UK we are selling off their future and instead choosing to commit our money to corporate greed and ineptitude (the banks after all have contributed significantly to the world’s current economic woes but have benefited monetarily more than anyone else). In Mexico the government seems to favour appeasing the US and investing in a ludicrous ‘war against drugs’ rather than investing more heavily in education and growing legitimate industries aside from the drug trade. There are no shortages of recent examples of young people trying to be heard, of letting us know that the system is not working for them – in Chile students have staged the largest protests since the end of the Pinochet regime, expressing concerns about the quality and cost of education, and were met with brutality from authorities and a response from President Piñera that education is a “consumer good” and so should be profitable. If we look at the massive political and societal unrest of the ‘Arab spring’ where revolution and widespread protests have had varying levels of success and tragedy, the unrest has undoubtedly been “sustained by the enthusiasm of the youth for change”. We need to recognise that the economic violence that is being perpetrated against young people today requires our best efforts. Time and time again we choose to value profit margins and property rights over the value of human life. Young people across the globe are struggling for survival while their governments continue to pursue conservative economic agendas. Maybe instead we should be fighting to give our youth a chance – to have prospects for employment, to feel like their voices are heard, to be active and cared for and valued members of our communities. Because all signs point to the fact that we are currently a long way off.